An injectable solution containing nitroxynil eglumine for use in cattle and sheep against immature and mature liver fluke. POM-VPS. Solution for injection. Clear, orange-red solution containing nitroxynil (as N-ethylglucamine salt) 34% w/v. 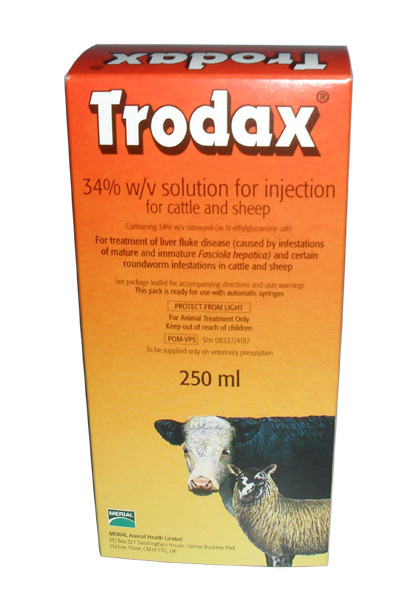 TRODAX 34% solution is indicated for the treatment of fascioliasis (infestations of mature and immature Fasciola hepatica) in cattle and sheep. It is also effective, at the recommended dose rate, against adult and larval infestations of Haemonchus contortus in cattle and sheep and Haemonchus placei, Oesophagostomum radiatum and Bunostomum phlebotomum in cattle. However, TRODAX 34% should not be regarded or used as a broad spectrum anthelmintic. The standard dosage is 10mg nitroxynil per kilogram bodyweight. On farms with fluke-infested pastures, routine dosing should be carried out at intervals of not less than 49 days (7 weeks), having regard for such factors as the past disease history of the farm, the frequency and severity of neighbouring outbreaks and regional forecasts of incidence. In outbreaks of acute fascioliasis advice on the best treatment should be sought from a veterinary surgeon. Cattle: 1.5ml of TRODAX 34% per 50kg (1cwt) liveweight. Both infected and in-contact animals should be treated, treatment being repeated as considered necessary, though not more frequently than once per 60 days. The treatment of cattle helps reduce contamination of pastures on farms where fascioliasis is endemic or certain roundworm occurrence is evident. Small swellings are occasionally observed at the injection site in cattle. These can be avoided by injecting the dose in two separate sites and massaging well to disperse the solution. No systemic ill effects are to be expected when animals (including pregnant cows and ewes) are treated at normal dosage. Ensure the injection does not enter subcutaneous muscle. Ewes in advanced pregnancy should be handled and dosed carefully. Estimate the weight of the sheep carefully and use injection equipment calibrated to accurately deliver the calculated dosage. TRODAX 34% solution stains and care should be taken not to spill it, especially on the fleece of sheep. In the event of accidental overdose, the symptoms are pyrexia, rapid respiration and increased excitability. Patients should be kept cool, and dextrose saline should be administered intravenously. Do not retreat at intervals less than 60 days (cattle) or 49 days (sheep). · Underdosing, which may be due to underestimation of bodyweight, misadministration of the product, or lack of calibration of the dosing device (if any). To date, no resistance to nitroxynil has been reported. The use of the product should be based on local (regional, farm) epidemiological information about susceptibility of trematodes and nematodes and recommendations on how to limit further selection for resistance to anthelmintics. Wear impermeable gloves to avoid staining the skin. Wash splashes from skin and eyes immediately. Obtain medical help if irritation persists. In case of accidental or deliberate ingestion, wash out the mouth with water and obtain medical help. Care must be taken to avoid accidental self-injection. Seek medical assistance in case of accidental injection. Cattle may be slaughtered for human consumption only after 60 days from the last treatment. Sheep may be slaughtered for human consumption only after 49 days from the last treatment. Not permitted for use in animals producing milk for human consumption, including pregnant animals intended to produce milk for human consumption. Do not dilute or mix with other compounds. Once the container has been broached, the contents should be used within 28 days. This product does not contain a preservative. Avoid the introduction of contamination. Should any apparent growth or discoloration occur, the product should be discarded. Multi-dose containers of 250 ml and 2x500ml. Nitroxynil is active against triclabendazole-resistant Fasciola hepatica. No signs of incompatibility are to be expected if TRODAX 34% is administered to cattle or sheep concurrently with therapeutic doses of levamisole, or with clostridial vaccine. TRODAX 34% is safe for use in pregnant animals. Active substance: Nitroxynil 34.0% w/v (as N-ethylglucamine salt). Solution for injection. Clear, orange-red solution. 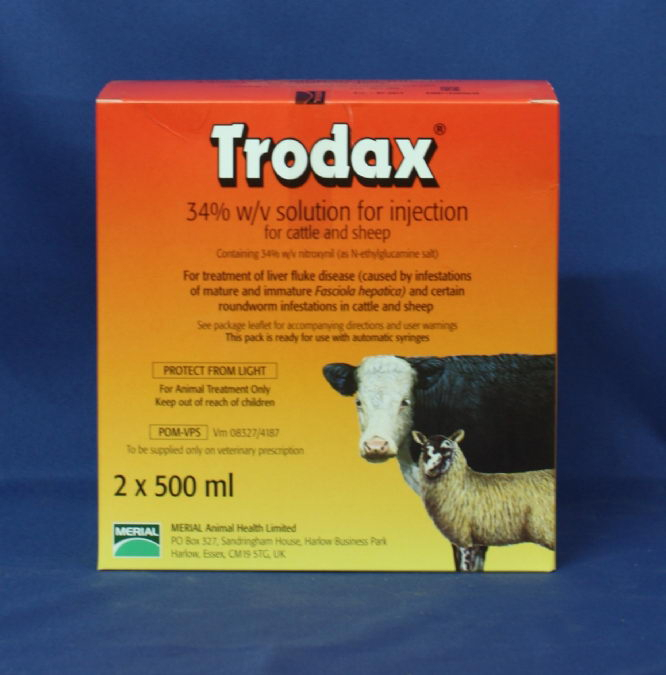 Trodax 34% is indicated for the treatment of fascioliasis (infestation of mature and immature Fasciola hepatica) in cattle and sheep. It is also effective, at the recommended dose rate, against adult and larval infestations of Haemonchus contortus in cattle and sheep and Haemonchus placei, Oesophagostomum radiatum and Bunostomum phlebotomum in cattle. However, Trodax should not be regarded or used as a broad spectrum anthelmintic. Do not use in animals with known hypersensitivity to the active ingredient. Do not use in dogs as fatalities have been reported. Do not exceed stated dose. Ensure the injection does not enter subcutaneous muscle. Ewes in advanced pregnancy and not intended to produce milk for human consumption should be handled and dosed carefully. Estimate the weight of the sheep carefully and use injection equipment calibrated to accurately deliver the calculated dosage. Trodax solution stains and care should be taken not to spill it, especially on the fleece of sheep. Wear impermeable gloves to avoid staining the skin. Wash splashes from skin and eyes immediately. Obtain medical help if irritation persists. In case of accidental or deliberate ingestion, wash out the mouth with water and obtain medical help. Care must be taken to avoid accidental self-injection. Seek medical assistance in case of accidental injection. This product is safe for use in pregnant animals. No signs of incompatibility are to be expected if Trodax is administered to cattle or sheep concurrently with therapeutic doses of levamisole or with clostridial vaccine. Administer by subcutaneous injection. To ensure administration of a correct dose, bodyweight should be determined as accurately as possible as overdosage may result in signs of toxicity; accuracy of the dosing device should be checked. The standard dosage is 10 mg nitroxynil/kg bodyweight. Sheep: 1.5ml of Trodax 34% per 50kg (1cwt) liveweight. On farms with fluke-infested pastures, routine dosing should be carried out at intervals of not less than 49 days (7 weeks), having regard for such factors as the past disease history of the farm, the frequency and severity of neighbouring outbreaks and regional forecasts of incidence. In outbreaks of acute fascioliasis advice on the best treatment should be sought from a veterinary surgeon. Cattle: 1.5ml of Trodax 34% per 50 kg (1 cwt) liveweight. Both infected and in-contact animals should be treated, treatment being repeated as considered necessary, though not more frequently than once per 60 days. The treatment of cattle helps to reduce contamination of pastures on farms where fascioliasis is endemic or certain roundworm occurrence is evident. The dosing tables are given as a guide. Cattle or sheep that fall between the weights listed must have their dose calculated appropriately. In the event of accidental overdosage, the symptoms are pyrexia, rapid respiration and increased excitability. Patients should be kept cool, and dextrose saline should be administered intravenously. Cattle may be slaughtered for human consumption only after 60 days from the last treatment. Sheep may be slaughtered for human consumption only after 49 days from the last treatment. Not authorised for use in cattle and sheep producing milk for human consumption including the dry period. Do not use during the last trimester of pregnancy in heifers which are intended to produce milk for human consumption. Do not use within 1 year prior to the first lambing in ewes intended to produce milk for human consumption. Do not store above 25 °C, protect from light. Once the container has been broached, the contents should be used within 28 days. This product does not contain a preservative. Avoid the introduction of contamination. Should any apparent growth or discoloration occur, the product should be discarded. Multi-dose containers of 250 ml and 2 x 500 ml. Below are some recent questions we've received regarding Liver Wormer Trodax 34% for Cattle & Sheep, including answers from our team. Is 18 ml the maximum dose for cattle even if an animal weighs 700kg ? The dose rate for cattle is 1.5mls per 50kg bodyweight, so a 700kg animal would need 21mls. There is a meat withdrawal period of 60 days from the last treatment.